The messages may seem to be in conflict, but they’re at the core of a new nonprofit in Atlanta. The group, OPENspace ATL, is on a mission to bring pop-up art galleries to vacant commercial spaces around the city. 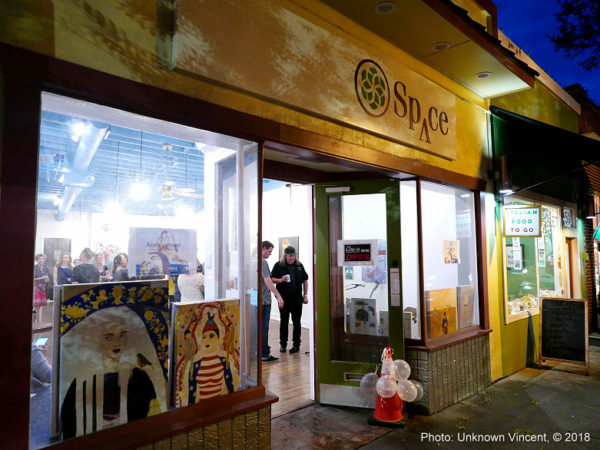 The space in Virginia-Highland – once a spice shop – is their first go at it. 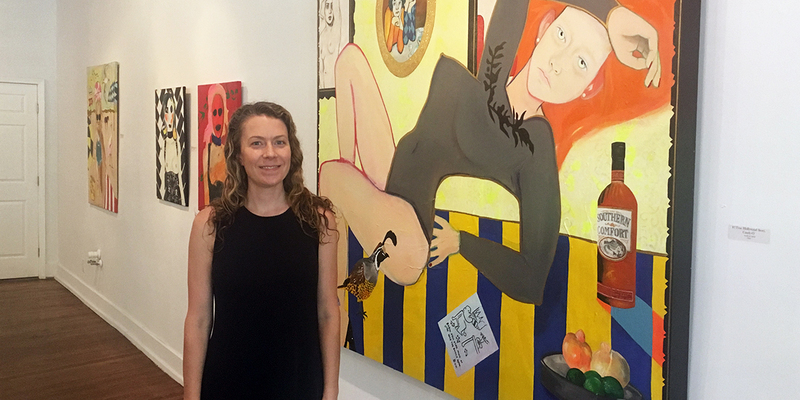 Since mid-September, it has housed “Impending Sneeze,” a solo show comprised of 25 pieces by local artist Anna Jensen. Jensen has been painting full time for a decade, but even for her, she said it was refreshing to see her work displayed in this way. “It’s equally wanting to provide artists with the opportunity to show their work in places. Why not? It’s just sitting there empty, and it definitely surprises people on the street with something other than just buying things that are mass produced,” she said. 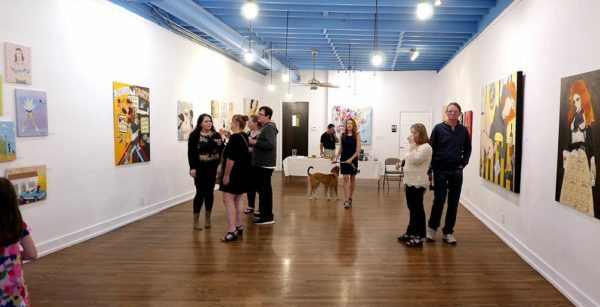 The idea for OPENspace ATL first came about last year when Jensen was looking for a space where she could display some of her work while also giving a platform for other local artists. She applied to rent a commercial space Bob Emerson owns near Little Five Points. Although Emerson went with another tenant’s application, he wished he had allowed Jensen to display her work in the space while it was empty, since he knows firsthand what a chance like that can mean to an artist. His son, an artist in New York, had been given a similar break. This summer, Emerson decided to make good on the idea that was brewing in his head and reached out to both Jensen and the owner of the vacant space at 1048 N. Highland Ave. Both were happy to sign on. The people behind OPENspace are quick to acknowledge the generosity of the property’s owner, but the partnership seems to be symbiotic: the group spiffed up the space with a deep clean and a fresh coat of paint. They also attract foot traffic to an area that would otherwise be sitting empty. With Emerson’s real estate connections and Jensen’s ties to the art world – they feel like they’re on to something. But they face challenges that are commonplace in the worlds of arts and nonprofits, chief among them: proper funding. They don’t pay rent to be in the space. Instead, the owner collects 10 percent of any sales made, but there are still other expenses: an insurance policy, utilities and construction materials to name a few. Emerson footed the bill to get the space ready for the first show and the forthcoming group show, which will be held in the same space after Jensen’s show is complete, but after that, their future is fuzzy. However, Jensen is heartened that they’ve found a way to integrate art into Atlanta’s neighborhoods without the barriers of entry present at some high-profile galleries. “This is more to be in neighborhoods where people who wouldn’t ever go to those shows get to experience real art,” she said. The response so far has been overwhelmingly positive, Jensen and Emerson both say, and they’re hopeful they’ll get on the map in time to get the funding and passionate participants needed to sustain themselves. 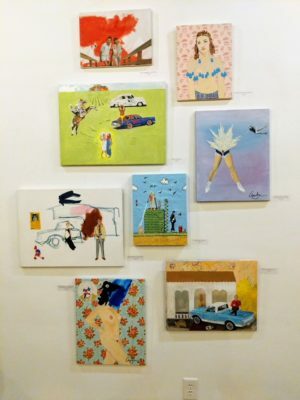 “There’s just something magical in paint and in the sculptures or whatever it is that a person touched and cried while they were doing or sung music or laughed or whatever,” she said. “Impending Sneeze” is open at 1048 N. Highland Ave., Atlanta 4-9 p.m. Wednesday-Friday; noon-9 p.m. Saturday; and noon-6 p.m. Sunday; or by appointment. The next show will open on Oct. 19 and feature the work of nine local Latin-American artists, including Esteban Patino.